In business for 50 years, all of our meat is locally sourced and a we provide a delicious range of delicatessen food. Conveniently located in the middle of Fulbourn High Street, the shop is open throughout the week and until 1pm on Saturdays. You can now enjoy our great range of locally farmed, high welfare meat, deli items and pies delivered to your door. Home delivery available in Linton and Saffron Walden and surrounding villages. Conveniently located in the middle of Fulbourn High Street, Beaumont Butchers is a traditional butchers shop that combines friendly customer service with a wide range of high quality meat and poultry products. 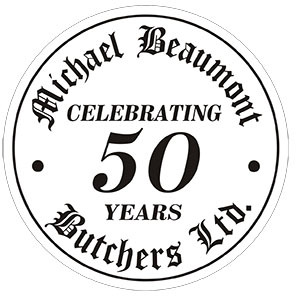 In 2016 we celebrated 50 years of being in business as local family butchers, and look forward to serving you for the next 50 years. Our meat is sourced from local producers including our beef which comes from the family farm in Great Wilbraham. We only buy from farms with high animal welfare standards and we would be delighted to explain more about the range of products we sell when you come in. We are open throughout the week and until 1:00pm on Saturday. If you would like a particular cut of meat for a special occasion, please give us a call a few days in advance and we will make sure it is waiting for you when you come in. Sign up to our Facebook page for news about special offers and opening times over public holidays.